If something happens to you and you are unconscious or otherwise incapacitated, what will happen to your financial affairs? Who will keep up with your bills, manage your investments, and notify your creditors? Fortunately, there are legal tools available to ensure that everything can remain in order when you are no longer able to make your own decisions. A durable power of attorney (POA) is a legal document that authorizes another person to make decisions and take action on your behalf. This can be an effective tool for ensuring that others make decisions regarding your finances, healthcare, and living arrangements in accordance with your wishes. You draft a durable power of attorney while you have mental capacity, and the authority you designate survives (i.e., stays durable) if you become incapacitated. The document grants decision-making powers to a specified individual, and you can choose to limit the scope of those powers or not. Many people in Missouri have one power of attorney who handles their financial and legal affairs. This includes paying bills and taxes, dealing with lawsuits, managing retirement and investment accounts, and more. This designated person will be able to access your accounts as your authorized agent. Other people choose to have the same or separate power of attorney for their healthcare, which some people call a “healthcare proxy.” This person will make decisions regarding both your daily care and treatment, as well as end-of-life measures. In both situations, you want to be sure that your power of attorney understands your situation, goals, and wishes. They should know about your various accounts and how to access them. If you have important documents stored away, tell them where they are. The more preparation and information they have, the less interruption there will be in your financial and legal affairs. Even though it is not always comfortable to consider the end of your life, you should draft a living will and share it with your healthcare POA. A living will sets out your wishes for end-of-life treatment, including a do-not-resuscitate (DNR) order if you so choose. The more this person knows about your wishes for medical treatment, the better. Drafting your powers of attorney documents and your living will is critical to your estate plan. You want to be sure your plan protects your interests if you cannot make your own decisions. This can prevent a costly and stressful guardianship case for your family, and it also puts you in control over who can make your decisions. Choose someone reliable and who you trust to have your best wishes at heart. There are many ways to take control of your financial affairs, healthcare decisions, and living arrangements. 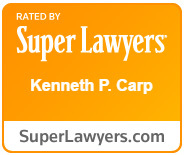 Experienced St. Louis estate planning attorney Kenneth P. Carp can help you access the estate planning tools that are right for you. Call (636) 947-3600 today or contact us online today to schedule your consultation. We are ready to discuss a comprehensive estate plan for your situation.